If you have questions, ask HD Foundations about using steel piers vs. concrete piers. We service the Dallas, Fort Worth, Tx areas. If you’re having foundation repair, review the pros and cons of both. It’s best to study your options before making a decision. While steel piers are very strong and stable, concrete piers are far more popular. Learn more about it. Why Choose HD Concrete Piers Or Steel Ones? The reason these structural supports are good choices is because they are both capable of carrying a tremendous amount of weight. Concrete is heavy and solid, while steel last virtually forever and that’s important when it comes to your foundation. You’ll want to study the differences. You’ll discover that concrete has been used for centuries because it has so many applications. Steel is one of the best materials ever manufactured. See for yourself why concrete piers work. Or, if steel piers are of interest, find out more. Which Piers For Foundation Repair? Both types are good so it’s hard to say which piers would be the best choice for your foundation. Deciding between concrete pilings and steel foundation piers isn’t easy. It really depends upon your situation. If you’re not staying in the same house for a long time, why pay to install steel pilings when repairing your foundation? And, if the soil in your area isn’t remarkably deep, concrete piers will be just fine. In fact, they might be the better structural foundation support to use. 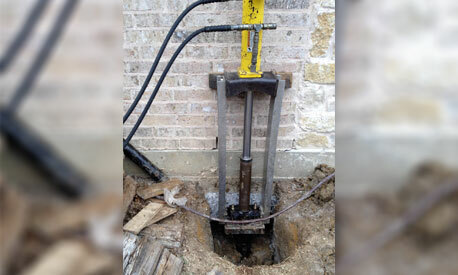 Most Dallas, Fort Worth area homeowners ask HD to use concrete piers vs. using steel piers for foundation repair because they’re less expensive. HD Foundations can also install them to what is called “the point of refusal,” too. Because the depth they achieve is generally between 12-15’, that’s far enough in most regions. You’ll need to study the facts. Piers that are made of steel may be needed in areas when the soil is 22′ deep. That’s why it’s hard to say which is best and which is worst. There are lots of advantages to using both types of foundation piers. The question of whether to use steel piers vs. concrete pilings is something foundation repair contractors like HD Foundations is asked a lot. The answer depends on a lot of things, and that’s why you need to review the advantages of one vs. the other. Because foundation piers are generally warrantied, if the concrete piers do move or shift, they can be adjusted by the contractor that installed them. This means that steel piers may not be worth the extra cost, even though they’re excellent. Take time to review all your options. These supports offer advantages because they can be driven deeply into soil. Steel piers can be pushed up to 75’ into the soil, until they reach solid bedrock. This is important when installing them under or around your foundation in this area. You’ll learn that steel piers have several great advantages over concrete piers. Some foundation repair contractors swear they’re the best. Because steel piers can be installed very deep, vs. concrete piers which aren’t, Dallas, Fort Worth property owners sometimes do choose the steel supports. Ask HD Foundations to tell you more. It pays to study how soil affects them and know the advantages and disadvantages of both. The movement is particularly troublesome in the upper layers of the dirt. Because steel piers are installed so deep into the ground, they are not as affected by the soil movement as other types of foundation piers. That’s one distinct advantage and reason why many people think they’re best. In addition, steel piers can support more weight. At HD Foundations, we’ll be happy to tell you all about them. The primary disadvantage of installing steel pilings is their cost. That’s without a doubt the worst thing about them. As a result, the majority of property owners in local area cities choose not to use these foundation supports. Steel costs considerably more to manufacture than concrete, and the equipment used to do the actual installation is expensive, too. Another one of the few disadvantage is this: If the steel piers aren’t pushed all the way down, they can move. This is a problem which can cause issues and that’s why you should consult with a foundation contractor before repairs are made. It’s critical that steel foundation piers are installed to a depth where they reach bedrock or solid strata that can support the load. If it’s a case of steel piers vs. those made of concrete, inquire at HD Foundations about it. Protecting your Dallas, Fort Worth house or commercial structure is important so get lots of information. Pilings made of concrete offer many advantages, too. One big benefit is that they don’t cost a lot and that’s important to everyone. Fact is, piers manufactured from concrete are far less expensive to make than pilings made of steel. That’s one reason that these foundation piers cost a lot less. Plus, using concrete supports doesn’t require investing of extremely expensive equipment. Of course, concrete piers have a few disadvantages, too. 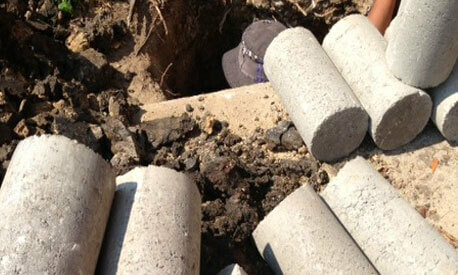 For one thing, they can’t be installed as far into the ground as steel piers when performing foundation repair. Thats considered to be one of the disadvantages of these pilings. So when it comes down to deciding on steel piers vs. concrete piers, you’ll have to remember that most areas in and around Dallas and Fort Worth don’t have extremely deep soils so it’s not a major issue. You’ll find out that they both have superior qualities, and will need to figure out which of the two types of foundation piers to use, and which will work better for your particular type of foundation. As with anything, there are many advantages and disadvantages. For more about using these pilings for your foundation repair project, contact HD Foundations. We’ll be happy to stop by and evaluate your property and explain more about these. Just schedule a free estimate on concrete or steel piers online today. HD Foundations services the entire DFW area.